Billposter Hoardings in St Georges Parade circa 1940. 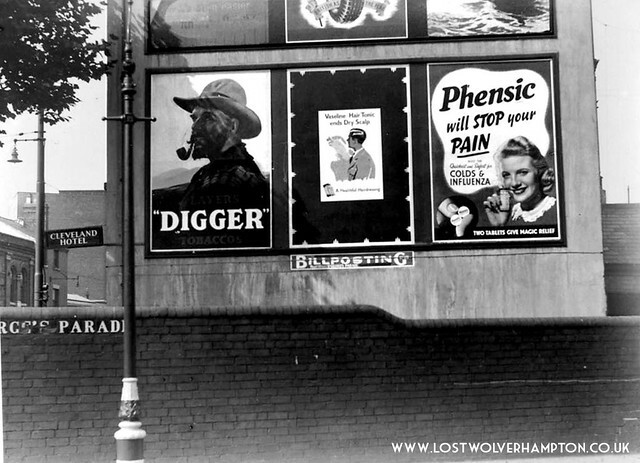 Billposters were a feature in Wolverhampton in my youth, they fronted almost any bits of waste ground, adorned many gable ends and they appeared in the most unlikely places. This one in particular was in St Georges Parade which was incidentally the address of The Wolverhampton Billposting Company. Now even today when I recall these Billposters, my mind goes immediately back to the Colliery Road and the 1940’s, at which time was the home of my maternal Grandfather John Henry Stevens, born in Great Bridge Road Tipton, son of labourer Joseph Stevens. I knew him for just five short years. I went many times with my mother, to their family home in Colliery Road during the War, and spent a lot of time with my Grandad Stevens whom I remember as being slim built old gentleman, who moved around the house with a lovely sweet tobacco aroma following him. And when I ran and fetched him an ounce of Digger Flake for his pipe , from the local tobacconist at the bottom of Colliery Road he would show me how to open the secret draw in the magnificent sideboard that dominated their front parlour. They had at that time three unmarried sons, two living at home, Les, who worked on the railway, Horace, working close by at The Chillington Tool Co. and Alf was away on service in the Air Force. Grandad passed away peacefully in his chair one summer evening, clutching a winning bet of six fourpenny cross doubles – he still loved his daily flutter. Perhaps it was the shock of his good fortune that day, which brought on the heart attack that killed him. He was buried at Holy Trinity in Heath Town in 1947, and I was just ten years old when he died. In those few short years I shared with my grandparents I would discover more about the diverse character of Horseley Fields, and length of the canal than ran from this bridge to Broad Street basin, than I could have gathered from any history book. So lets take time to share memories of their Horseley Fields, with a few evocative pictures taken at various times during the past which I hope will jog the memories of those who lived through them and provoke the imagination of those who did not. Looking down Horseley Fields from five ways and Queen Street in 1960. This is the view from the bottom of Queen Street, showing the top of Horseley Fields, a dog-leg-shaped road about a mile long, where along its length, it catered for every type of trade and business. It had, as I recall in the 1950’s, three different denominations of Church venue, the principal one named after its own adjacent Square, St James’s. Horseley Fields could even boast its own picture palace the “Globe” which later became the “Carlton”. Not though the adjoining Railway Offices, and the “New Hotel “ on the corner of old Mill Street. The first Pipers Row Bus Station brought about the destruction of those iconic buildings, nearly thirty years ago. On the left of the Inn, outside of which in the 1940’s the queue would form for the return bus journey to Willenhall , was a Herbalists. The proprietor of many years was George Bottomley, who in his window at that time displayed a poster which became a source of amusement to passers by. It showed a dog chasing a coffin on legs, with the caption ‘Stop that “Coffin and Barking”‘ – an advert for a popular cough medicine. 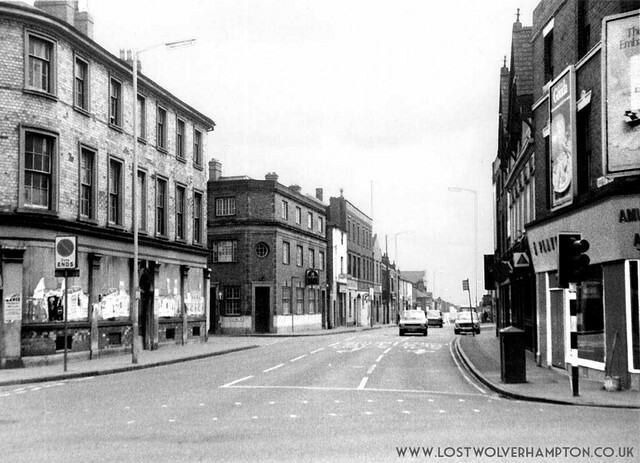 Later occupants of this shop premises in the 1960’s were “Pete the Pirate” who introduced cut price grocery sales into Wolverhampton, and he was later followed in by George Wilson, a bookmaker on the birth of Licensed Betting Office’s. On the opposite side of Horsely Fields to the Herbalists was St James Square. A small piece of the map of the town -1827 shop the area around St James’s Square. 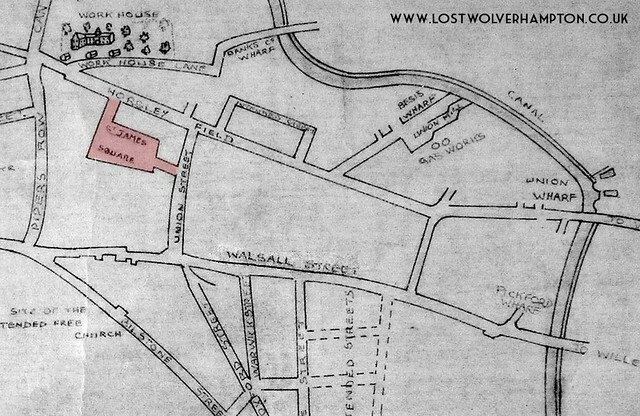 In the first instant St James Square was probably called Horseley Field Square, and in the STAFFORDSHIRE GENERAL & COMMERCIAL DIRECTORY for 1818, there is a Horseley Field House in the square, owned by John Glover. It’s probable that the Square owes its development in some way to the opening of the Birmingham Canal navigation in 1772, as by 1802 most of the canal wharfs and basins were established in Horseley field. We know St James Square was in existence for many years before St James’s church, for if you look on Smart’s Trade directory from 1827 (Pictured above) it shows just the Square. The outlet into Union Street and the one into Horseley Field. There are about 24 dwellings at that time with occupants listed as Japanners, Shoe, Hinge, and Lock makers. Woollen and Linen Drapers. Merchants and factors, Excise officer – Commercial School – a few private residences, and and two Licensed houses “The George Inn”, and “The Crown & Anchor”. The view looking from across the Square into the South – West corner. The Square as my grandfather would have seen it at the dawning of the 20th century. 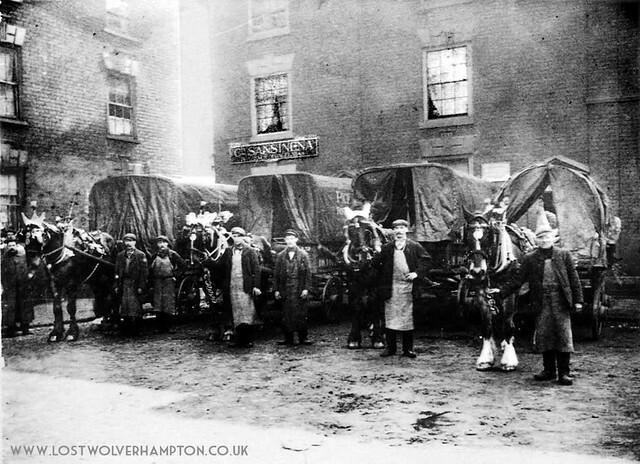 Pickfords, the Walsall Street carriers; show off their fine single horse wagons decked out for a May Day parade. They are lined up outside the premises of “Sansinena”, a chilled frozen Meat and Offal, importers. Sansinena’s main offices were in Smithfield, London, but they had premises in all the principle towns in the U.K. The view looking into the Square from Horseley Fields late 1950s. The Square appeared rather run down to me in the 1950’s. But if you look at the building in the background, on the south side of the square, which for many years was the offices and works of Mulliner and Company printers and paper merchants. You can get an idea how this grand square, planted then with trees, and bordered by tall three storey buildings would have looked at the time of the Regency. 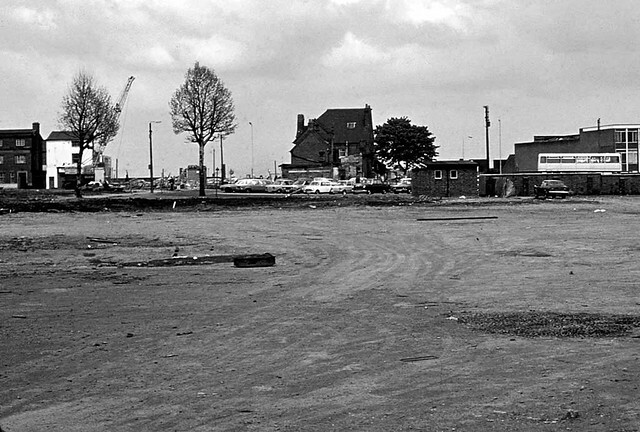 The view from Walsall Street toward Horseley Fields after the squares demise in the 1970s. Picture courtesy of David Clare. The Square eventually fell to the sixth and final stage of the ring road. The tall arm of the crane stands out side the former herbalists in Horseley Fields, and time is about to be called at the “New Inn Hotel” next door. The centre of the picture, shows the rear of the lone surviving building in the Square now awaiting demolition. Ted Hughes has vacated his Florists and Greengrocers business in what was once the old George the third Hotel. On the far right of the picture we see the a small piece of the newly built and ill fated Postmans Delivery Building and Post Office on the corner of Corn Hill. Perhaps the final humiliation of the unjustified removal of the Square, is in the failure to remember it in the current ring – road names . Surely a more fitting name for the passage through Horseley Fields should have been St James’s. Where did St David’s, its current name, enter the thinking from? After leaving school some evenings us lads would meet in town and I can well remember going to the Globe Cinema. We understood but without evidence that the building had once been a pig slaughter house and shall we say the strange smell supported this understanding. The seating at the time in what must have been the cheap seats at the front, as price was always important to us, was long wooden benches. We didn’t go too often to the Globe as the movable benches encouraged practical jokes not viewed with favour by the management. There will be two more posts regarding old Horseley Fields, before I reach the corner of Mary Ann Street and the former “Globe” Cinema, but you are absolutely correct with your observations. I often look at the posts for the area of Horseley Fields and wonder if folk remember our house and shops. 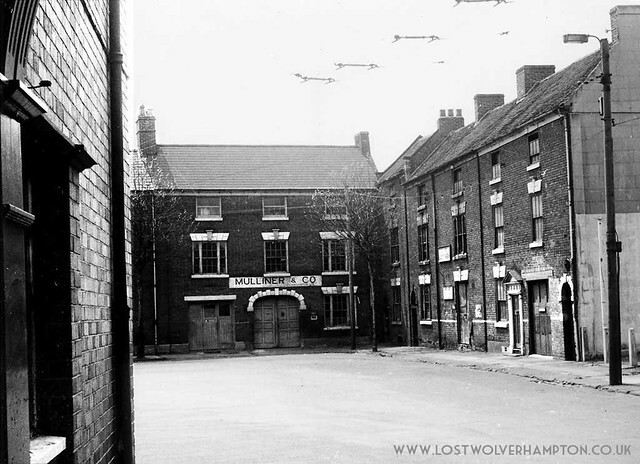 We lived at 165 Horseley Fields next door to the Swan Public House with Mr Hopcutt’s garage next to us. Our two shops were Breakwells cafe and the second hand and fishing tackle shop with our front door between the two businesses. We left the accommodation when I was about 10 (1956) due to rules regarding the lease. I understand there was lease connection to the Swan and possibly this was unable to be extended when my grandmother died in 1956. Her husband, my grandfather, was George Breakwell who was quite a character and a very accomplished and talented man had died just after I was born in ’46. So the lease was probably allowed to run until the death of his widow. We did retain the one shop and maybe someone remembers buying a watch or some fishing tackle from us. 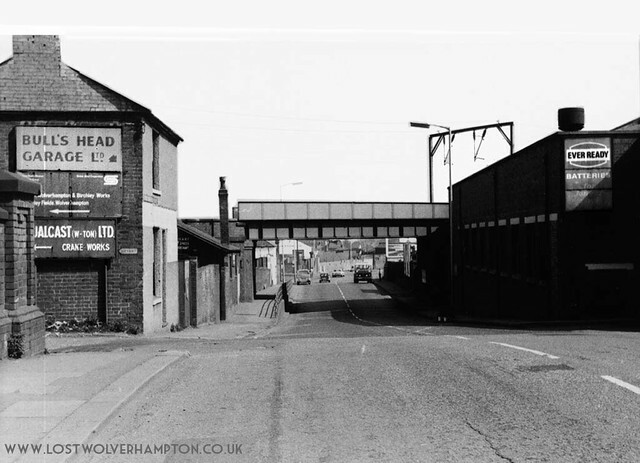 I always look for photos of our premises but all I can ever find are views from the bottom of Queen Street looking down the road with the shops etc. on the left and not in view properly. I did try to take some last photos just as the building were being demolished, sent them off (as you did in later years) and never got them back from the printers!! Just my luck, so if anyone has anything taken from the other side of the road showing not only the Swan but our missing shops, it would be wonderful. It would be good if I could hear from anyone with memories of our old shops or my mother, Betty Hobbs (nee Breakwell) who was involved in both businesses from the late forties to the late sixties. This may be difficult as I am now 70 and time marches on. I recall the shops next to the Little Swan When the we would on occasion alight from the Willenhall bus at the terminus in the time just after the war. Was it Tom Hobbs that kept the fishing tackle shop, he must have been your father. My grandmother was registered at Rennisons at that time. Later when I worked in the Wholesale Market I got to know Ted Hughes and Charlie Evans the two fruiterers close by. Please keep in touch.